In-cell dropdowns also make input easier by reducing unnecessary typing and errors in processing. 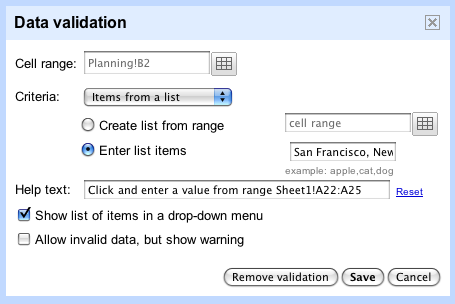 You can create dropdown lists in individual cells through the data validation tool by validating against a range of cells in your sheet or by creating a custom list. 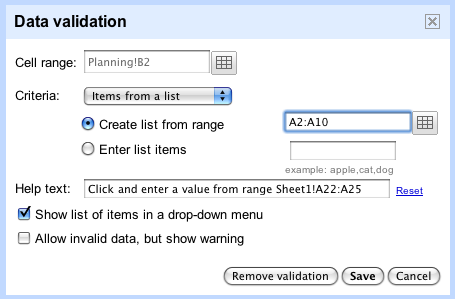 Follow these steps to create an in-cell dropdown list through validation against a range. Enter data into a range of cells. For example, create a list of destinations on your spreadsheet. Select the cell(s) you would like to validate. Click the button next to the ‘Create list from range’ option and select the range of cells you entered data in during Step 1. Click Save and the cell you chose to validate will have a dropdown arrow in it with the data in your cell range as the potential input values. If you want, you can set a cell to allow invalid data. You can also create a in-cell dropdown using a custom list. Click the button next to the 'Enter list items' option. Enter a set of custom values, separated by commas. For example, you could enter "San Francisco, New York, Chicago and Los Angeles." Click Save and the cell you selected will have a dropdown list with the values you entered as potential input values. Today, we added in-cell dropdown and validation to spreadsheets. This makes it easy to constrain the values of an individual cell to a specific range or list. For example, if you are building a trip planning spreadsheet, you can now limit the options in the travel destination column to a select set of cities via dropdown lists.